Opening an auto parts store online and turning it into a successful business is a challenge but can be accomplished once you build a world-class e-commerce site. This niche is not so overloaded with online stores as fashion clothing stores or stores with kids toys, but auto parts selling has its own issues and details. For example, there is a great range of assortment and fast and convenient filters should be placed on the website to search the right auto part easily. Moreover, automobile's theme is the most perspective for online business and this topic customers have a high LTV (lifetime value). Just imagine how much money average car-owner send to their car monthly. Even if the car is new, many car-owners like to buy auto accessories for their vehicles like floor mats, air fresheners, seat covers, anti-theft products and etc. As you know the auto parts market is huge and will most likely double by 2020 These data are motivating many sellers to build their own online store based on customers demands. But many issues and problems prevent from choosing this type of products for online selling. The first problem is a great line of car models and variants. 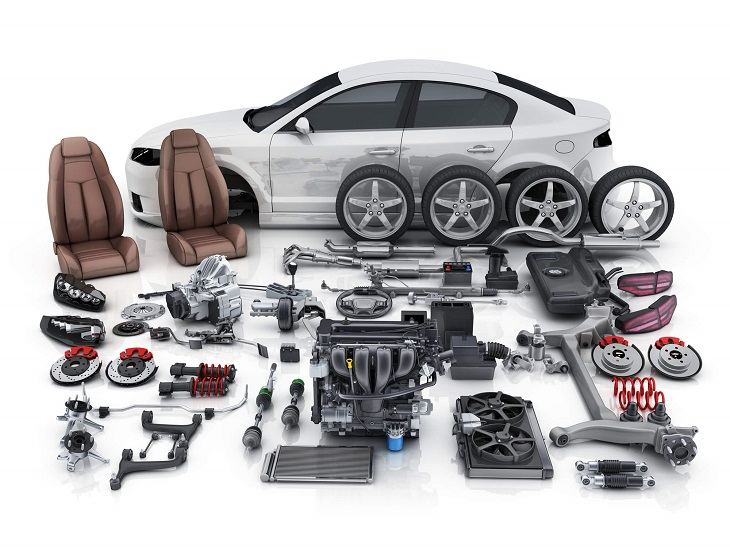 Remind how many components contained in one car and imagine the comprehensive range of spare parts in the shop. The second problem lies in the fact in the search functionality. Is it quite difficult to select the right fitment as some customers are ready to buy expensive genuine spare parts, others prefer to buy cheaper replicas. So good advice from the vehicle fitment data specialist is required. But online stores have no real specialists and the advice is given with the help of well-designed filters and calculators. Take a look at one example of the store where car wheels, tires, and rims are on sale. We have been creating this website for some months for one of our loyal customers. More details on the portfolio page. This is a Russian store build on CS-Cart platform. As we see almost every website connected with automobile topic has its own features and details. But the global structure of complex filters should be well-designed. It serves for better navigation on the store and helps customers to find the demanded products. What is the best functional for tire selection? It's quite hard to find the right tire for the car wheels especially if the customer is not a professional in this sphere. But if the website assists in selecting the appropriate products, the customer will certainly make a purchase. 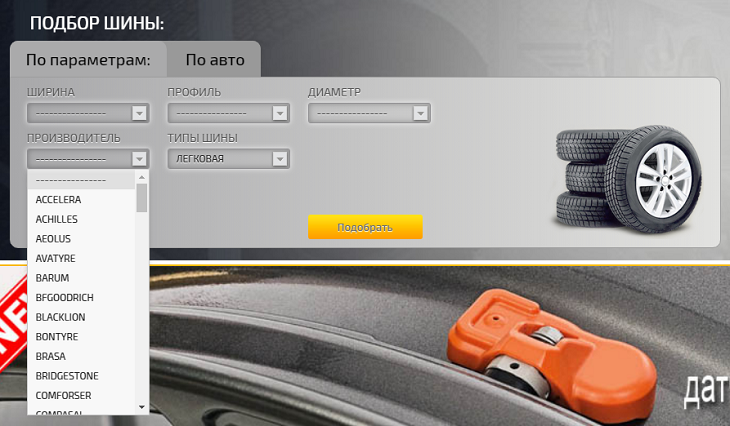 Let's take a closer glance on the mechanism of tire and rims selection on one of the popular Russian website. The picture is in Russian, but we give you some translation. We took to pieces one of the filters for product selection. But auto parts are quite specific goods for sale online and not only filter should be included on the online store. Since there are many brands of spare parts it is a challenge to present it in a user-friendly way. But, it's possible to make a block with all brand icons that are buttons. 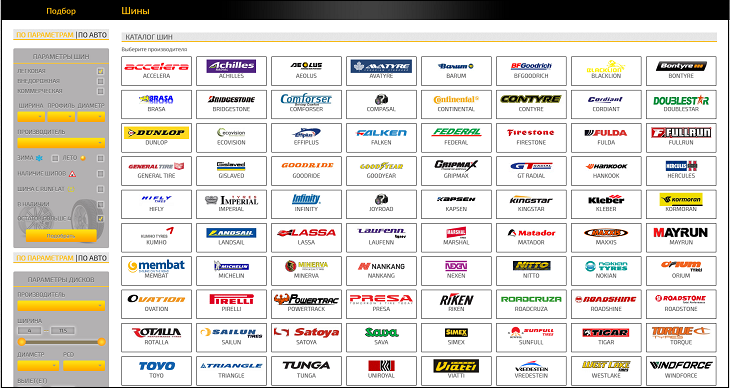 The customer can click on the icon and get the list of goods compatible with the selected vehicle brand. 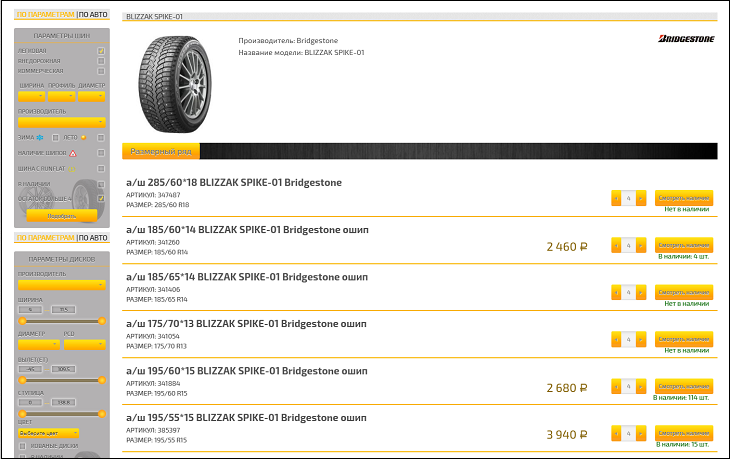 Here you can find all tire brands that can be sold in the online store. The customer can click on the icon of tire brand and choose the necessary product only among the goods of this manufacturer. As we examine the online store of tires and rims, the calculators are must have things on the website. Дюймовый калькулятор - inch calculator. ТЕКУЩИЙ РАЗМЕР ШИН - the existing setup. When the website visitor types their own digits of existing setup in the first line, they get РАЗМЕР НОВЫХ ШИН - the size of new tires and ИЗМЕНЕНИЕ ДОРОЖНОГО ПРОСВЕТА, мм - changing ground clearance, in mm, as a result. By clicking on the button Подобрать - Select, they get the range of products they need to reach the result. The same mechanism of the product selection is worked with the inch calculator. But the result is the approximate rim sizes. So the products are filtered by these rim sizes. When the customer goes to the catalog pages, the store owner should have an advanced filter functionality that is of the client's assistance. For example, the customer can ticks the appropriate fields of characteristics and the system will show only demanded products. Let's demonstrate the work of the user-friendly filter. The next important thing on the online stores connected to the car industry is the product page. To be honest, it's the most important part of the website. Because customers see prices here, read technical specifications and decide whether to buy the item or not. The Product Page on the online store should have many hints to motivate customer for purchasing. But to say the truth, on the examined website we hardly ever can boast of selling product page and it was a client demand to make it in this way. So, we have the main product - BLIZZAK SPIKE - 01 and many variations of this product with prices in the table above the product image. Some of the variations are in stock and the others are out-of-stock. 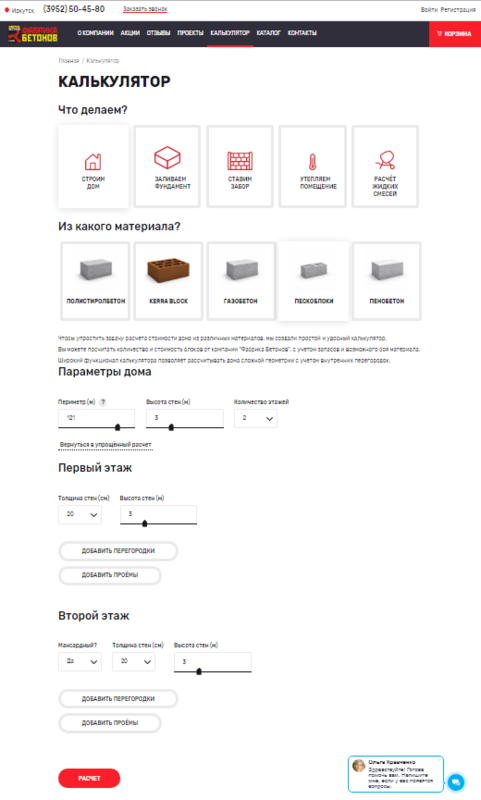 Also, there is a number of products in stock under the Смотреть наличие (check the stock) button. When the customer checks the quantity of product in stock, they can buy the wheels. The buttons В КОРЗИНУ (add to cart) and В КРЕДИТ (buy in credit) help to force a customer to make a purchase right now. Also, the approximate delivery time is shown: СРОК ДОСТАВКИ (delivery time) - 7 ДНЕЙ (7 days). Do you like this product page? To say the truth, the standard product page of CS-Cart platform looks like differ. 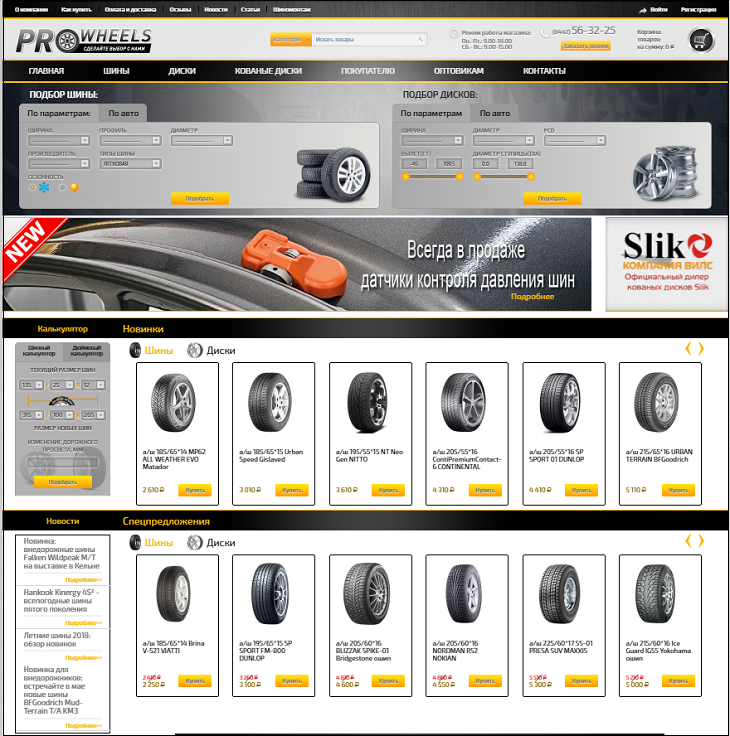 Our developers changed the website pro-wheels.ru a lot. CS-Cart is a great platform, but the store owners always want something special. Compare the CS-Cart (+ Unitheme) and modified CS-Cart by Alt-team. As you see our team of developers can change CS-Cart due to the demands of any business. If you are planning to sell auto spare parts and auto parts online, we can offer you the best development service.